If you are using Office 365, you are likely very aware that with Microsoft at the controls, they are frequently making a lot of changes. Sometimes that’s a great thing and sometimes that’s not, but on the whole it's a relief to not have to deal with an on-premise environment. Every month or so, Microsoft releases news about the recent changes that are being released. After going through February 2019’s update, I noticed a little but awesome change I wanted to call out regarding Microsoft Planner. Planner: "multi-plan" -- associate multiple plans Office 365 group - a nice way to make more plans for the same group of people. When you create a new plan, select "Add to an existing Office 365 group" - and then select the existing group and start assigning tasks; you can do this more than once to then have multiple plans associated to the same Office 365 group. You can also create a brand new Planner plan directly from the “+New” menu of your group-connected SharePoint team site. That is really awesome. Before, we could only have one plan per Office 365 group. If you clicked Create Plan, it would create an entire new Office 365 group! Boo! If we wanted one team / group to have multiple plans, you had to get creative in how you used labels and buckets. No more! 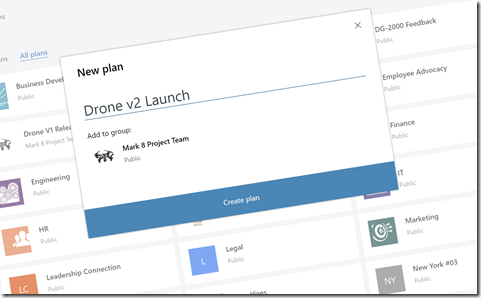 Microsoft has now given us the ability to create as many plans as we want for the same existing group! That really allows us to use the buckets and labels the way we want while separating all the tasks into their own plan. Maybe a PM wants to create a mini PMO, or the IT support group wants to have different plans for different deployment projects. Now you can! If you’re still on the fence and prefer your SharePoint task lists, be sure to check out my previous blog where I map task list functionality to Planner. Be sure to contact us for any questions with Microsoft Planner, groups or anything Office 365!